Boston drops Olympics bid: Here’s why Los Angeles should get it instead. The city once saved the mega-event from its bloated, economically burdensome self. Los Angeles could do it again. The Olympic Torch Tower of the Los Angeles Coliseum on the day of the opening ceremonies of the 1984 Summer Olympics. After a deadline shuffle between elected officials, civic boosters, and Olympic organizers, Boston is no longer America’s candidate for the Summer Olympics in 2024. What happened? According to the United States Olympic Committee, which sends its favorite American bid on to the event’s international governors, Bostonians didn’t want it enough. Polls showed residents were opposed to the idea. In a press release yesterday, USOC CEO Scott Blackmun wrote, “we have not been able to get a majority of the citizens of Boston to support hosting.” In light of that fact, he thought it unlikely the bid would be able to compete against rival bids from Paris, Hamburg, and Budapest. Walsh and Baker were right to be worried about money, even though Boston 2024 was designed to be an Olympics of relative modesty, at least compared to last year’s snafu in Sochi, Russia. Some $4 billion was to come from the private sector, lured into two brand-new neighborhoods by big tax breaks. The public would have financed $775 million in transportation improvements, mostly for upgrades to the city’s T subway. The insurance policy to protect the public from overruns was to be the largest in Olympic history. But as the opposition group No Boston Olympics countered, the bid supplied few firm details. All told, Boston 2024 (like most Olympic scenarios) was a flashy bid that had the potential both to solve some long-standing infrastructure and planning issues—and to cost many times more than its estimate. If the Olympic Games are a party that should leave the host with a mild hangover, not a foot-long bar tab, there’s one American city with a reputation for moderation: Los Angeles. And, thankfully, it looks like L.A. might be next in line to carry the United States’ Olympic bid. Add in last year’s mind-boggling corruption in Sochi and the ongoing calamity in Qatar, which will host the World Cup in 2022, and you can understand why Blackmun is talking about civic spirit and not municipal bonds. Boston’s is just the latest repudiation of Olymponomics. The competition for the 2022 Winter Olympics is down to Almaty, Kazakhstan, and Beijing, two autocratic capitals, neither known for its skiing, after a handful of European competitors decided it wasn’t worthwhile. In December, sensing flagging interest, the International Olympic Committee ratified “Agenda 2020,” which advocates “maximum use of existing facilities and use of temporary and demountable venues” as “positive aspects of a bid” that the organization would actively promote. If frugality is really what the head honchos want to see, the USOC may have stumbled into the perfect candidate in runner-up Los Angeles. It appears that the city’s bid requires virtually no big new infrastructure projects beyond what’s already underway. Holding the 2024 Summer Games in L.A. would mean reusing a city (L.A. would be the only one besides London to have hosted three Olympics) and reusing a main stadium (the Coliseum, which was completed in 1923). It could also mean reusing a storyline. The city’s 1984 Olympics followed on the heels of four predecessors that were all, in greater and lesser ways, disasters. The 1968 Summer Games in Mexico City opened just 10 days after the Tlatelolco Massacre, in which soldiers and police opened fire on student protesters, killing dozens. The 1972 Games in Munich ended in tragedy when Palestinian terrorists murdered 11 Israeli athletes and coaches after a standoff with the West German police. The Montreal Games in 1976 were a financial mess; the Moscow Games in 1980 were boycotted by the U.S., Japan, China, Canada, and West Germany after the Soviet invasion of Afghanistan. 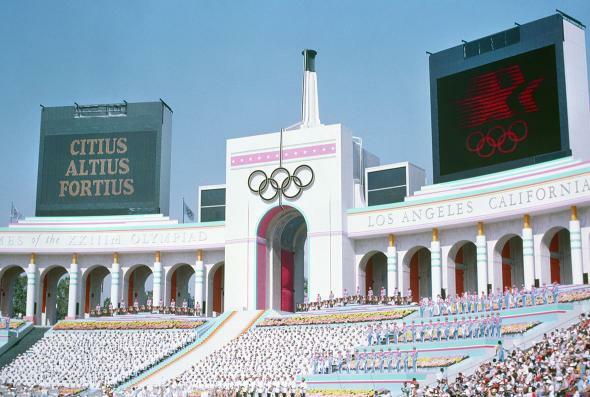 L.A. was the only city that submitted a bid for the ’84 Olympics, and it made a good deal with the IOC. The only new facilities were a velodrome and an aquatic center, financed largely by companies. With a mix of private-sector funding, television profits, corporate sponsorship, and adaptive reuse, the Los Angeles Games showed the way toward a profitable Olympics. The $232 million revenue from the Games funded a nonprofit, LA84, that supported sports in poor communities. Peter Ueberroth, who organized the competition, wound up being Time magazine’s Man of the Year. It was a redemptive story then; on the heels of Athens’ towering debts, Beijing’s white elephants, and the certain political turmoil that will overshadow the Games in Rio, it could be one in 2024, too. The city’s bid isn’t public, but it’s certain that whatever Mayor Eric Garcetti put forth to the USOC follows in the thrifty tradition of 1984, which remains a cherished civic memory there. Los Angeles bid, unsuccessfully, for both the 2012 and 2016 games. A preliminary document posted to the SCOOG website last year, seemingly by accident, revealed a plan with four clusters—Downtown and Expo Park, Westwood and the Westside, Long Beach, and Avalon—and dozens of existing venues. It doesn’t show any new infrastructure beyond what looks like a handful of ferry stops. In any case, by 2024, the city is set to have completed four sizable transit projects: the Crenshaw Line, the LAX Airport Connector, the downtown Regional Connector, and the extension of the Expo Line to Santa Monica. The so-called “Subway to the Sea” extension of the Purple Line down Wilshere Boulevard to the Westside will probably be coming along too. Because L.A. has, by some measures, the tightest housing market in the country, it shouldn’t be hard to get private developers working on the Olympic Villages, to be built near downtown and along the Los Angeles River, which is currently being restored, and could be used for kayaking and canoeing competitions. Despite all that new construction, if the city remains committed to SCOOG’s goal of getting 80 percent of spectators to the Games by public transit, it will have to take another lesson from 1984. L.A. was the first city since Rome in 1960 to host the Summer Games without a regional rail system, and the head of California Highway Patrol’s Olympic Planning Unit warned the L.A. Times that “traffic jams in the Coliseum area during the Games may be so severe that some motorists may abandon their cars on the freeway.” He recommended the city devise an efficient towing system. In fact, the Games were a largely traffic-free spectacle, and the air was cleaner than usual, as Angelenos went out of their way to avoid the roads. Congestion fell by 60 percent as commercial deliveries were made at night, employers let employees work from home, and streets reversed their flows to smooth traffic. But most of all, what made the 1984 Games go was a specially devised Olympic bus network, which, when it was rolled out, became (on its own) the fourth-largest transit system in the state of California. Spectators, athletes, and the press all piled into municipal buses, school buses, and more, which were given special priority on local roads. It worked. Elements of that plan have been incorporated into special events over the years, like the Papal Visit of 1987, and officials from Sydney and Beijing came calling to learn from Los Angeles, a city not otherwise a poster child for innovative traffic engineering. Could an enormous fleet of municipal buses impress the U.S. Olympic Committee and its international counterpart as much as the new airports, highways, and rail lines that other cities have promised? If the USOC is serious about promoting a temporary, sustainable Olympic infrastructure, it should.